USS DENVER was the sixth AUSTIN - class amphibious transport dock and the third ship in the Navy to bear the name. 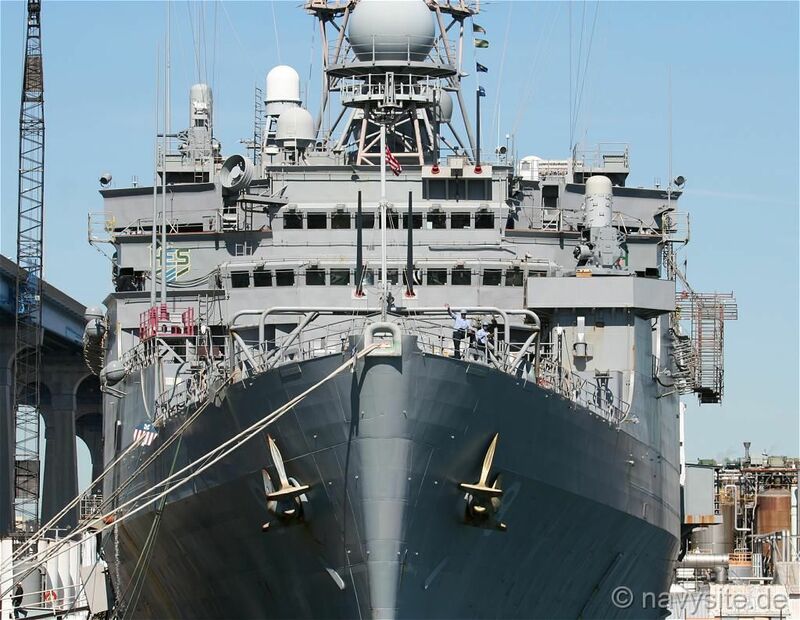 The ship held a decommissioning ceremony at Pearl Harbor, Hi., on August 14, 2014, and was officially decommissioned on September 18, 2014. The DENVER is presently laid up at West Loch, Pearl Harbor, Hi. Builder: Lockheed Shipbuilding, Seattle, Wa. This section contains the names of sailors who served aboard USS DENVER. It is no official listing but contains the names of sailors who submitted their information. 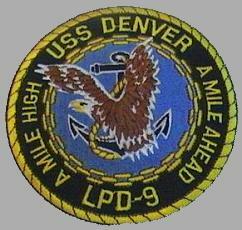 Click here to see which USS DENVER memorabilia are currently for sale on ebay. During a replenishment operation at sea the USS DENVER collided with the USNS YUKON (T-AO 202). 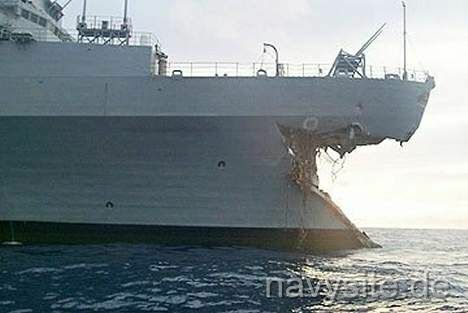 DENVER suffered a gaping 40-foot hole in the bow from the second deck to the waterline and YUKON suffered major damage, including several large holes and dents above the water line on the starboard quarter of the vessel. No one was injured, and there were no fuel leaks. After the collision some experts warned of a phenomenon called the "Venturi Effect,'' in which a powerful suction is created near the stern area of one ship that can pull in an overtaking vessel at close quarters, causing a collision. 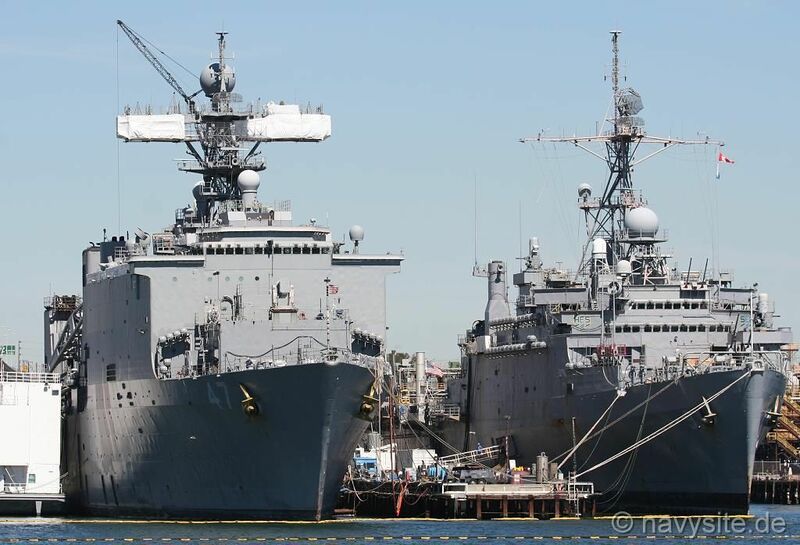 Following the collision, USS DENVER arrived at Bravo 3 in Pearl Harbor so that Pearl Harbor Naval Shipyard workers and members of the Intermediate Maintenance Facility could make temporary repairs to the ship to ensure a safe return to the West Coast. 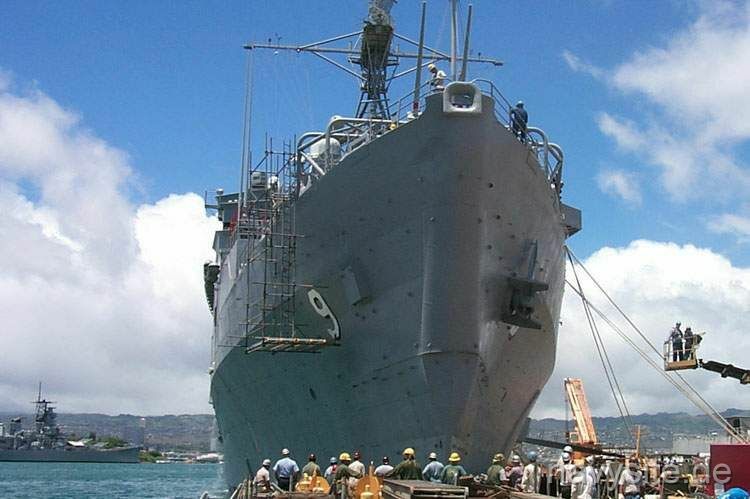 Repair efforts went on 24 hours a day, seven days a week and were finished on July 27 when DENVER left Pearl Harbor for a full-speed run to test its repaired bow. Afterwards she completed her six-month deployment by returning to San Diego, Ca. The area repaired was roughly 40 feet high and 24 feet back from the bow. About 54 tons of new plates and beams had been installed and held together with 1,300 pounds of welding electrodes (rods). DENVER started out at 12 knots, increasing speed at two-knot increments and holding for five minutes each time. The ship attained maximum speed at 18 and a half knots, which was excellent considering it was carrying a full load of fuel. 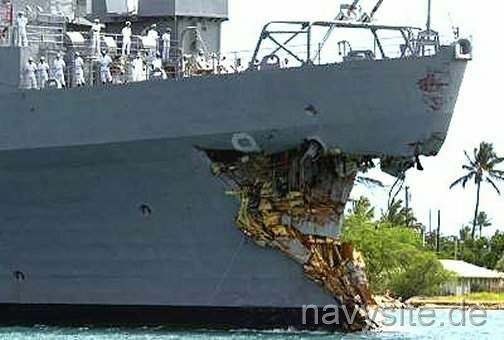 The investigation into the accident found USS DENVER responsible. The pictures below are showing DENVER during her arrival in Pearl Harbor respectively with her repaired bow on the last photo. USS DENVER was laid down 7 July 1964 at Lockheed Shipbuilding and Construction Company, Seattle, Washington. She was launched 23 January 1965, christened by Mrs. John Love, wife of the Governor of Colorado, and commissioned 26 October 1968. Following her commissioning in 1968, DENVER proceeded to Puget Sound Naval Shipyard in Bremerton, Washington, for a three-month outfitting period, after which she steamed to her homeport of Long Beach, California, arriving in January 1969. February marked the beginning of DENVER�s initial four-week underway training, which was followed by a two-week amphibious training period. 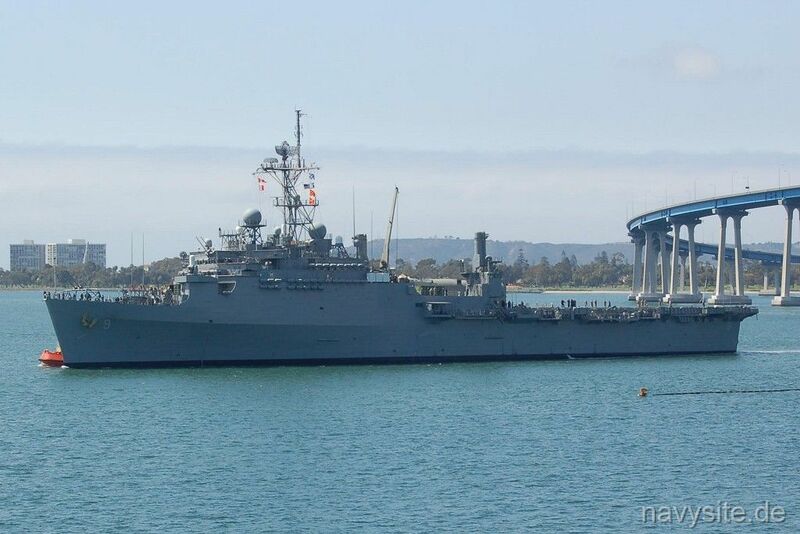 In April she made a voyage to Acapulco, Mexico, for rest and relaxation, and again DENVER commenced her return trip to Long Beach Naval Shipyard, where she underwent her post-shakedown availability. 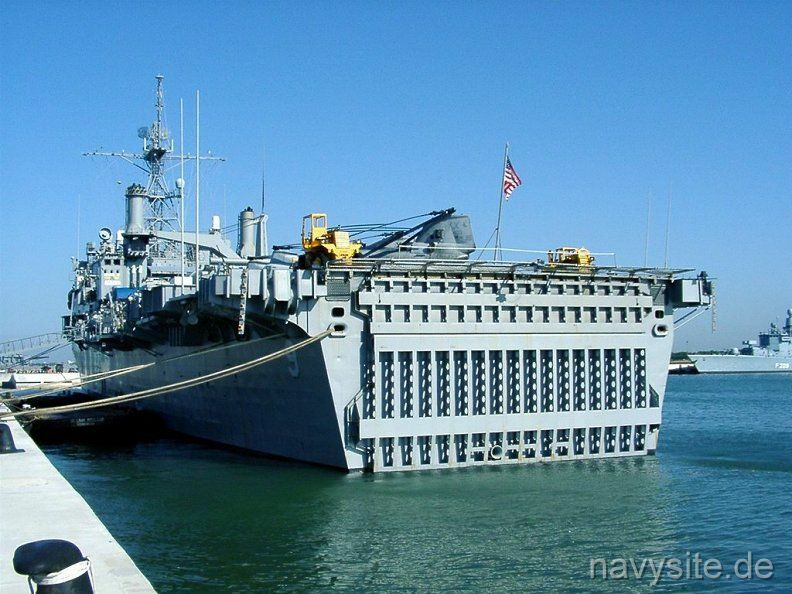 Departing homeport early in October 1969, she proceeded to San Diego, California, for interim refresher training and further amphibious training. Her return to Long Beach took place in the end of November, and she remained there until the end of the year. Underway training included a gun shoot on 2 February 1970 and an underway replenishments from the USS KAWISHIWI (AO 146) on 5 February. While the DENVER was alongside the port side of the KAWISHIWI with two fuel rigs connected, the USS MONTICELLO (LSD 35) made contact with the KAWISHIWI while approaching her starboard side. DENVER executed emergency breakaway procedures and no personnel or material casualties resulted on DENVER. The KAWISHIWI and MONTICELLO both received minor damage, but both ships were left capable of carrying out assigned missions and no personnel were injured. Underway replenishment was resumed after a short delay and completed without further incident. 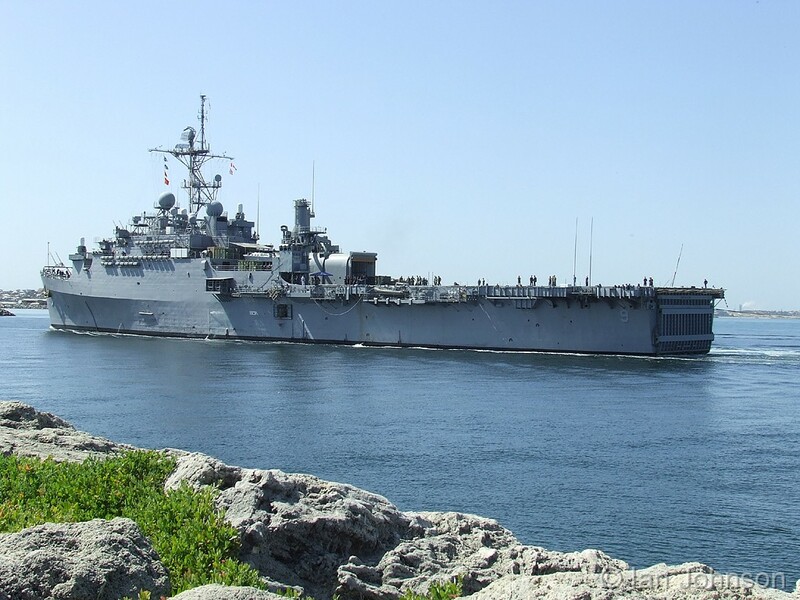 The Commanding Officer of the DENVER was directed to conduct an informal investigation of the incident by Commander, Amphibious Squadron Seven. On 10 February, ALAMO (LSD 33) and ANCHORAGE (LSD 36) were detached and DENVER proceeded independently for Okinawa. On 11 February, DENVER passed from the operational control of Commander, First Fleet to that of Commander, Seventh Fleet. DENVER moored at US Naval Station, White Beach, Buckner Bay, Okinawa to offload cargo, debark US Marine Corps personnel and take on fuel. 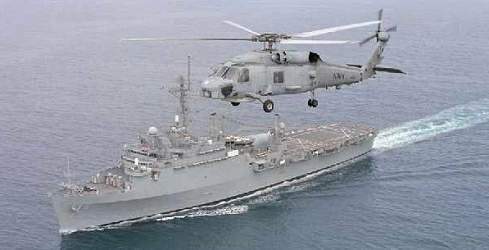 Upon completion, DENVER was underway on 17 February for Subic Bay, Republic of the Philippines with Commander, Amphibious Squadron Seven embarked, and arrived in Subic Bay to moor outboard of the USS MONTICELLO. 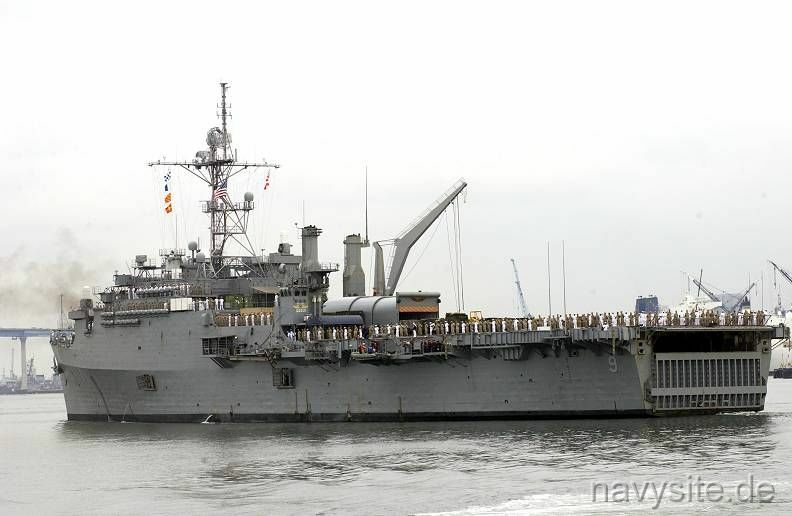 DENVER was underway for Da Nang on 10 March. Commander, Amphibious Squadron Seven returned to his flagship when DENVER reached Da Nang on 13 March. Two fuel pontoons were loaded for delivery to DENVER's next stop Vung Tau, and the DENVER left Da Nang the same day. 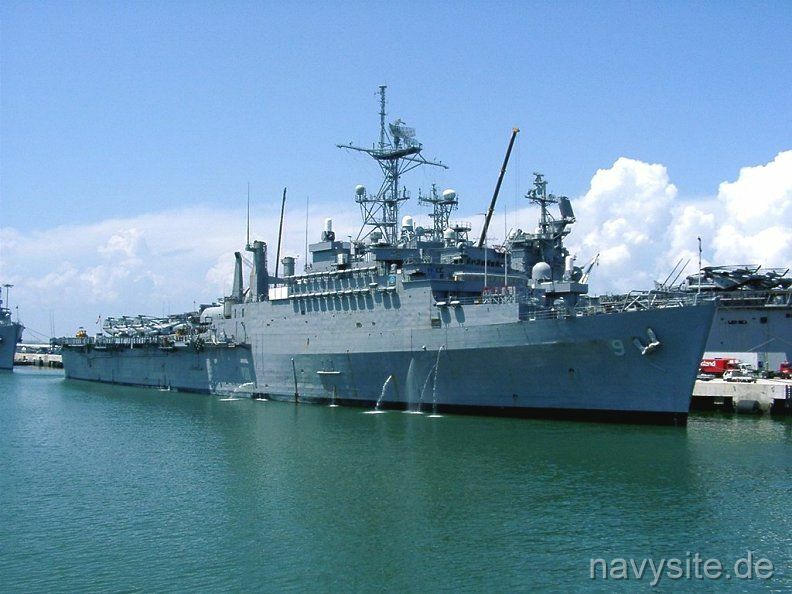 DENVER quickly offloaded the two fuel pontoons the afternoon of 14 March in Vung Tau, Republic of Viet Nam, and was underway for Singapore, expecting to arrive there 17 March. However, DENVER was diverted by operational commitments and the trip was delayed and finally cancelled while the DENVER was involved in the SS COLUMBIA EAGLE incident. On 18 May, DENVER was underway with the other four ships of Amphibious Squadron Seven for amphibious training and Hong Kong. DENVER also obtained 2 UH-1E helicopters and support detachment as an after-effect of the increased readiness posture. While entering Hong Kong Harbor, the USS WASHTENAW COUNTY collided with the KOTA SELATAN of Singapore registry in dense fog on 23 May. No personnel casualties resulted but a considerable amount of damage to the WASHTENAW COUNTY took place. The WASHTENAW COUNTY followed the other ships to anchorage in Hong Kong Harbor. DENVER ship fitters gave extension assistance (10 men expending 352 man-hours) to patching the 6 foot by 30 foot hole on the port quarter of the WASHTENAW COUNTY. DENVER was underway again the morning of 14 March 1971 enroute to Hong Kong. The transit was interrupted by the SOS of a Chinese merchant vessel, the WING HING. DENVER proceeded with all due speed to the reported disaster position to search for survivors. DENVER began a search pattern off Luzon Island which eventually resulted in visual contact with an empty lifeboat at 19 33.0� N, 117 36.0 E. DENVER maneuvered for the best position, then ballasted down, lowered her stern gate and brought the lifeboat into the well deck. After deballasting, DENVER was again underway in search of survivors. A lifeboat without survivors was sighted about 1700, but it was quickly followed by visual contact of another lifeboat with an apparent survivor. DENVER maneuvered, then lowered the motor whaleboat to attempt rescue. Rescue was accomplished and the lifeboat of the survivor was also taken aboard. DENVER then returned to pick up the empty life raft previously sighted at 19 34� N, 116 51.5� E.
This year DENVER's crew received the Vietnam Service Medal with 2 stars. April 1972 DENVER's crew received the Republic of Vietnam Campaign Medal. In May DENVER's crew received the Combat Action Ribbon and in June received the Navy Unit Commendation from the Secretary of the Navy for making aeronautical history as the first ship to launch U.S. Marine attack helicopter on missions in North Vietnamese waters. WestPac 73'-74' the ship made port visits to the following locations: Pearl Harbor, HI; Sasebo, Japan; Philippines; Okinawa; Taiwan; Hong Kong; and Korea. Length of WestPac, approx. 8 months. During this WestPac USS DENVER was designated a "Flag Ship" with Rear Admiral Price serving as the Acting Commander. The ship got underway at midnight on 18 April 1975 for a holding area off Vung Tau, South Vietnam. On the way plans were made and facilities set up for the possibility of holding many thousands of refugees. On 22 April DENVER moved to an area within sight of Vung Tau and assumed her position amongst some 48 other ships of the US Seventh Fleet. On 29 April DENVER became one of the first ships to receive South Vietnamese refugees as "Huey" helicopters began arriving onboard. In order to make room for more helicopters, seven had to be jettisoned over the stern. During all this confusion the ship�s special organization for handling refugees was called into action and the orderly progression began as our new charges were directed to use the well deck for temporary shelter and assistance. During the next several days the ship processed some 7,500 Vietnamese refugees through the well deck and into our waiting Assault Craft Unit ONE landing craft. After processing they were shuttled to waiting Military Sealift Command ships. The hours became incredibly long as Marine helicopters came aboard with load after load of refugees, yet the crew of DENVER willingly stayed on the job assisting and feeding the thousands of refugees. These last refugees were all taken in by boats of the Amphibious ships and some landing craft that were salvaged and manned by DENVER�s crew. In the end, the MSC ships were all filled and the warships started taking on refugees for transport to Subic Bay, Philippines. DENVER�s share came to over 500 people who were bedded down under a "tent" city which was erected on the flight deck amidst salvaged helicopters. Earlier in 1977 after completing a major overhaul, DENVER participated in the operational evaluation of USS TARAWA (LHA 1) and a midshipman training cruise to Alaska and Canada. While traveling from Hong Kong to Pearl Harbor during the period 30 November - 15 December 1981, heavy seas were experienced from 1 - 3 December. 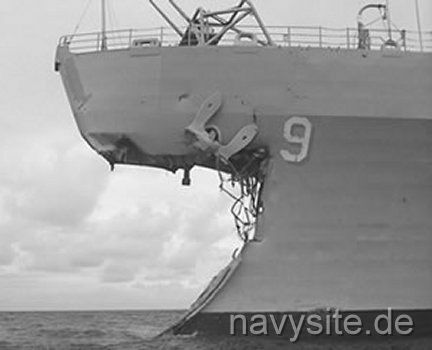 DENVER sustained damage to the motor whale boat davit, one 50-foot dual yoke whip antenna, and the loss of the H frame and lower platform of the port accommodation ladder. During the tropical storm, DENVER was called upon to transfer eight 55-gallon drums of lubricating oil to USS SCHENECTADY (LST 1185) to correct a casualty. This evolution was done via Manila highline under hazardous conditions and was carried out without incident. 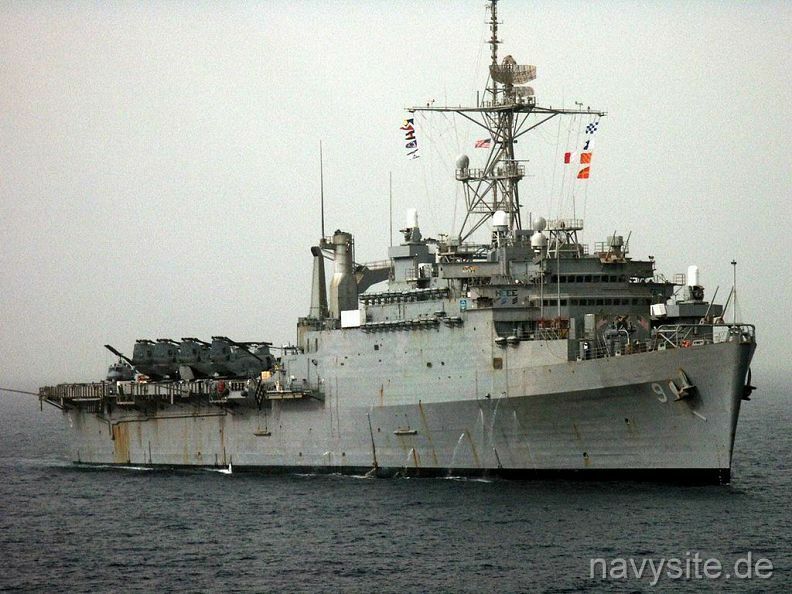 In 1983 after exercise Balikitan / Tangent Flash �83, DENVER headed south for one week of liberty at Hong Kong. While moored to a buoy there, the ship�s bull nose suffered complete structural failure. High winds at the ship�s beam caused the anchor chain to rip through the bull nose and across the deck destroying the bull nose, the hatch to the forward gear locker, and several life rails. The sea and anchor detail was hastily manned, but the anchor chain held and despite the damage the ship remained moored to the buoy. 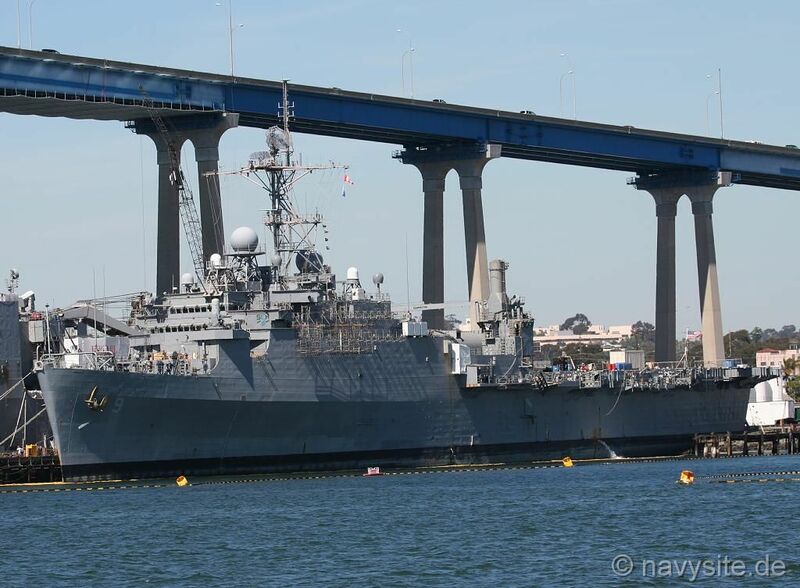 In January 1989, DENVER departed San Diego on deployment number twelve to the Western Pacific which included several port visits in the far east including Hong Kong, Yokosuka, Sasebo, Pusan, Pohang, Subic Bay, and Okinawa. During this deployment DENVER participated in the combined U.S.-Republic of Korea Forces Amphibious Exercise, TEAM SPIRIT '89. In May 1990, DENVER participated in RIMPAC '90 exercises with the Navies of Australia, Canada, Japan, and South Korea. 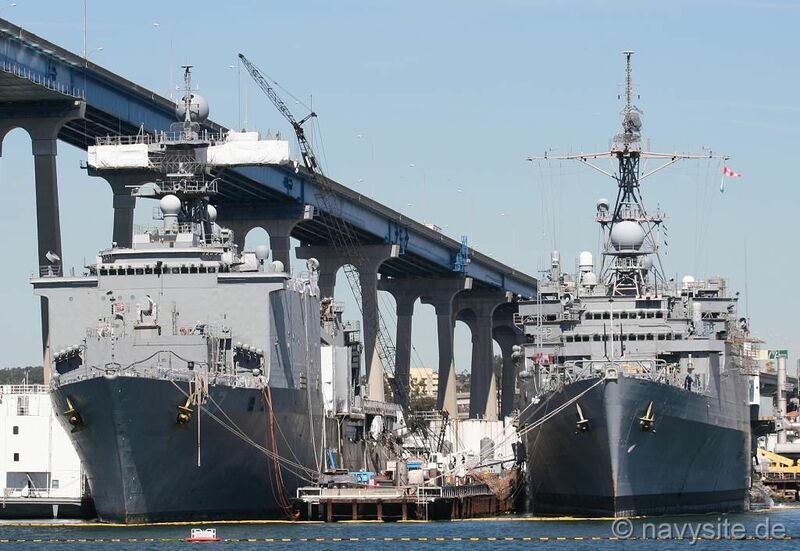 In December 1990, DENVER departed San Diego as part of a 13 ship Amphibious Task Force in support of operation DESERT STORM, the largest Amphibious Force to depart the West coast since the Korean War. 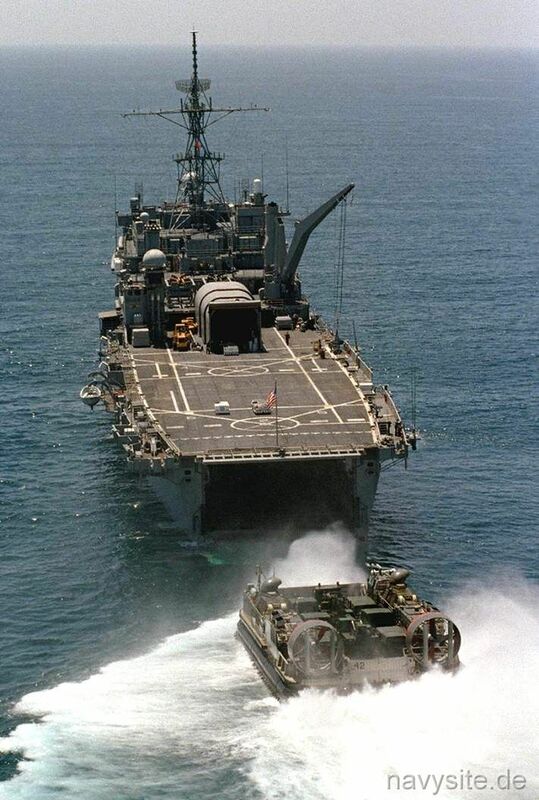 DENVER acted as the primary control ship for all amphibious ships in support of Operation Desert Storm. On 24 February 1991, embarked Marine and Navy units were tactically off-loaded off the coast of Al Mishab, Saudi Arabia just 20 nautical miles south of the Kuwait border. The units performed various combat roles in support of the successful ground assault phase of Operation Desert Storm. DENVER was awarded the Navy Unit Commendation for operations during the war. 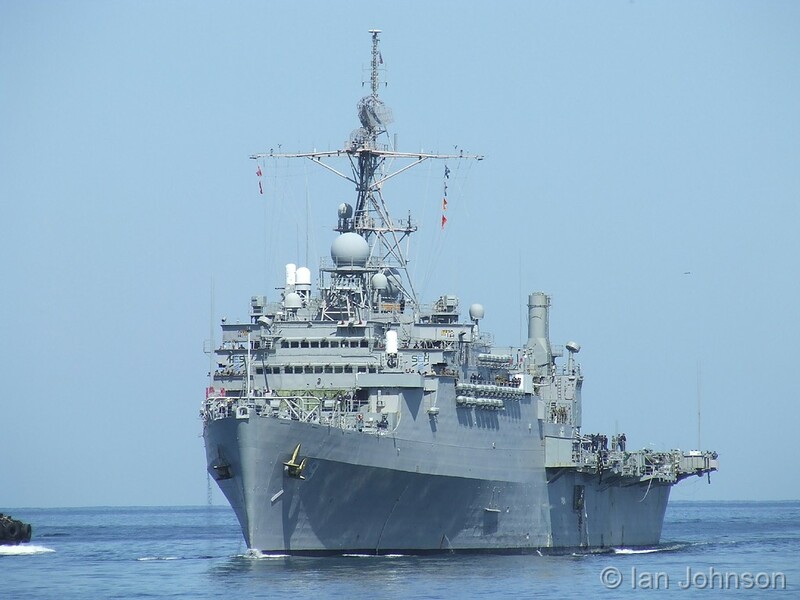 DENVER departed on the 14th deployment to the Western Pacific and was diverted one month into the cruise to the coast of Somalia in support of operation RESTORE HOPE in 1993. DENVER mostly remained at anchor to conserve fuel during the 4 month stay. The Commander in Chief, President Bill Clinton, also made a phone call to wish the crew, "Happy Holidays," and to say the American people were very supportive of their efforts. The Chief of Naval Operations, Admiral Kelso, and the Commandant of the Marine Corps, General Munday, also visited DENVER while deployed. On 13 November 1995 DENVER deployed to the Arabian Gulf in support of operation SOUTHERN WATCH with the USS PELELIU (LHA 5) Amphibious Ready Group and the 15th Marine Expeditionary Unit (Special Operations Capable). DENVER participated in exercises IRON MAGIC/IRON SIREN with the United Arab Emirates, PELMEUEX with Kuwait, and EASTERN MAVERICK with Qatar. 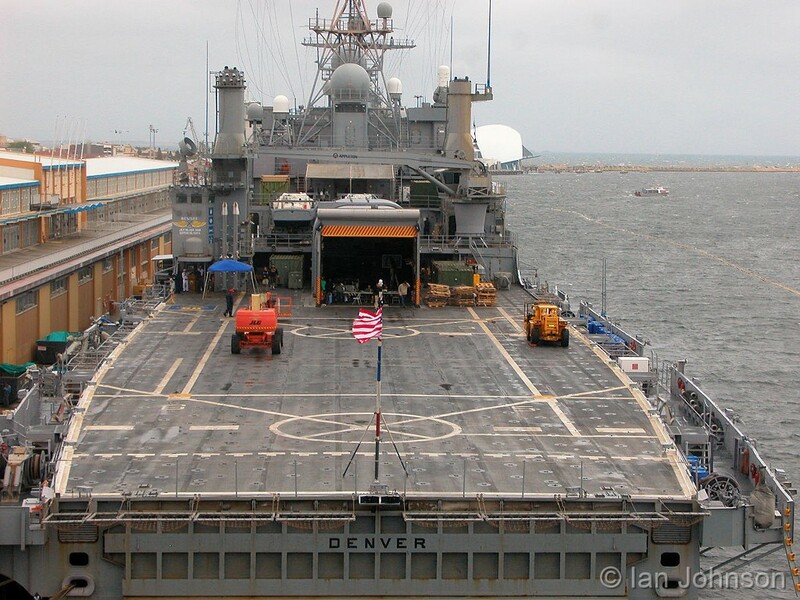 On 24 January 2000 DENVER departed its home port on deployment to the Western Pacific, Indian Ocean and Arabian Gulf. DENVER was involved in many vital operations and exercises. DENVER's first mission was to support peacekeeping and humanitarian operations of the international forces in East Timor. While in the Arabian Gulf DENVER joined other forces of the fifth fleet supporting operation Southern Watch. DENVER and the 15th MEU also participated in multinational exercises Eager Mace in Kuwait, Eastern Maverick in Quatar, and Sea Soldier in Oman. The ship had the honor of being one of the first amphibious ships to support Maritime Interdiction Operations (MIO) in the Arabian Gulf. A mission previously only conducted by destroyers and cruisers. DENVER's visit Board, Search and Seizure (VBSS) teams boarded five ships in support of United Nations Sanctions against Iraq. Port visits included Darwin, Australia; Phuket, Thailand; Manama, Bahrain; Kuwait City, Kuwait; Doha, Qatar; Jebel Ali, UAE; Muscat, Oman; Penang, Malaysia; and Hong Kong. DENVER also qualified 103 personnel as Enlisted Surface Warfare Specialist during its deployment. The photos below were taken in the western Pacific by Stefan Karpinski during DENVER's 2002 deployment. The photos below were taken by Ian Johnson and show the DENVER arriving at Fremantle, Australia, on October 16, 2007, while assigned to the BONHOMME RICHARD (LHD 6) ESG. The third photo was taken on October 17, 2007. This was DENVER's second visit to Western Australia. The photos below were taken by me and show the DENVER at Naval Base San Diego, Calif., on March 10, 2008. The ship moored next to the DENVER is the USS RUSHMORE (LSD 47).